You don’t have to be a diehard Apple fanboy or an Android fanatic to appreciate how impressive iPhone and Android devices are. Unless you’re committed to using only one of these two amazing mobile operating systems for the rest of your lives, you occasionally wonder how to move from a Galaxy to iPhone and iPhone to Galaxy back. Since Samsung wants to encourage more iPhone and other Android OEM users to join the Galaxy brand, and Apple wants users to move to iOS, they’ve made it easy for you to do so. 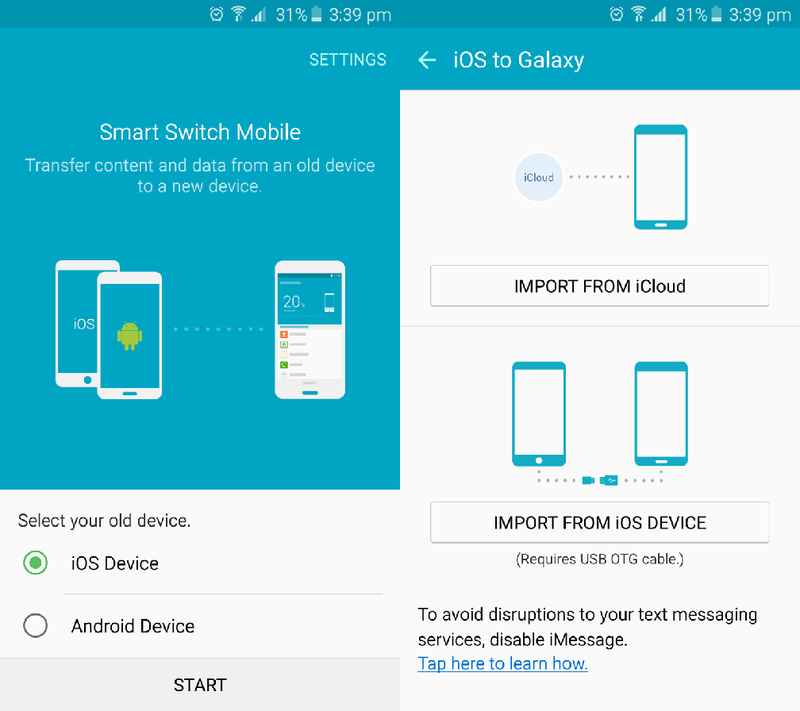 Here’s a simplified guide on how to move from Galaxy to iPhone with the Move to iOS app, and from iPhone to Galaxy with the Samsung Smart Switch app. Moving from an Android device to an iPhone has always been tricky since Apple likes to keep the iOS in a closed-circuit environment. 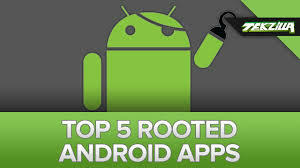 There have been plenty of third-party ways for Android users to move over to iPhone with all of their data and personal info with third-party devices for years now. However, Apple made it a whole lot easier for new iPhone users to get their data from the Android devices with the Move to iOS app. The app is available in the Google Play Store for free, so you can not only use it to move from Galaxy to iPhone but pretty much any Android device with ease. An iOS device (iPhone or iPad) running iOS 9 or newer. Samsung Galaxy device running Android 4.0 or newer. Make sure that both the devices are connected to the internet. You will be able to move your personal files and info from your Galaxy device right at the beginning when you begin the setup process on your iOS device. When you reach the Apps & Data screen on your iPhone or iPad, make sure to select the tab that reads – Move Data from Android. On the Move from Android screen, tap on the Continue button to generate a security code. Once you have downloaded the official Move to iOS app using the link given above, go ahead and launch it. You will be asked to enter a security code into the Move to iOS app on your Android device, so go ahead and enter the code displayed on your iPhone screen. 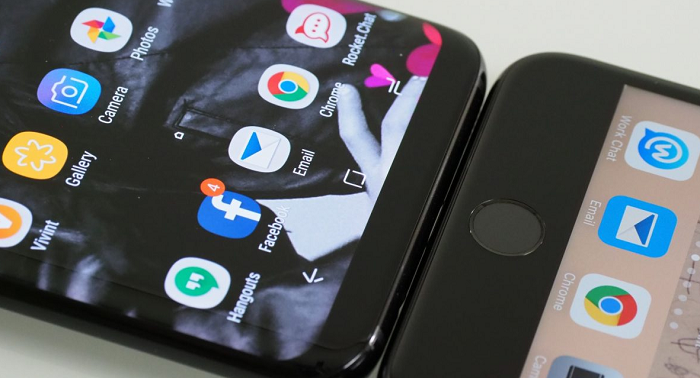 Once the app successfully pairs your iPhone and Galaxy devices together, a peer-to-peer network connection will be established. Now that you have created a secure connection between your Android and iOS devices, you get to selectively move some of the personal content. 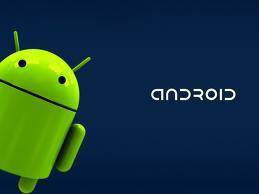 The app allows you to move your Google Account, Bookmarks, Messages, Contacts, and Camera Roll from the Android device to the iPhone. Since music files are copyright restricted due to iTunes policy and the Android apps are incompatible with iOS devices, you can’t copy them. 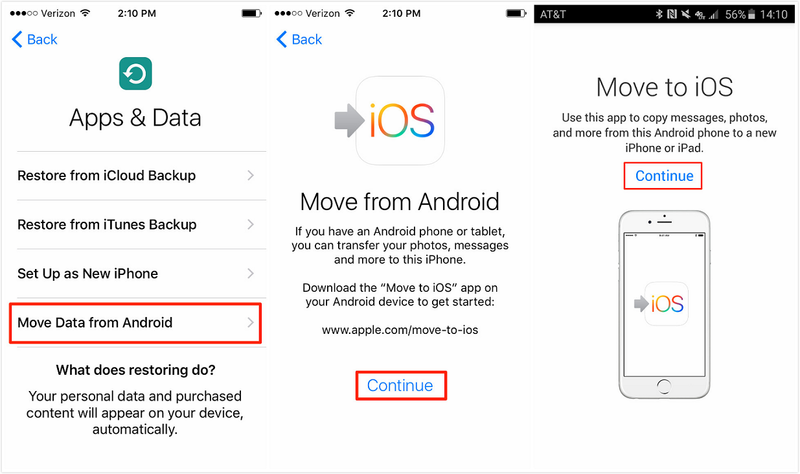 While the options to move from Android to iOS are quite limited, there are multiple ways to move your details from an iPhone to Android. Samsung has moved a step forward with the Samsung Smart Switch service which makes it easy for users to not only move from iPhone to Galaxy but also from any other Android device to a Galaxy device. An iOS device (iPhone or iPad) running iOS 4.2.1 and newer. Samsung Galaxy device running Android 4.3 and newer. Once you have downloaded and installed the Samsung Smart Switch application for your Windows or Mac computer, get your iPhone and Galaxy device ready. Before you begin, make sure to backup your iPhone with the iTunes software on the computer and the Encrypt iPhone backup option is not enabled. 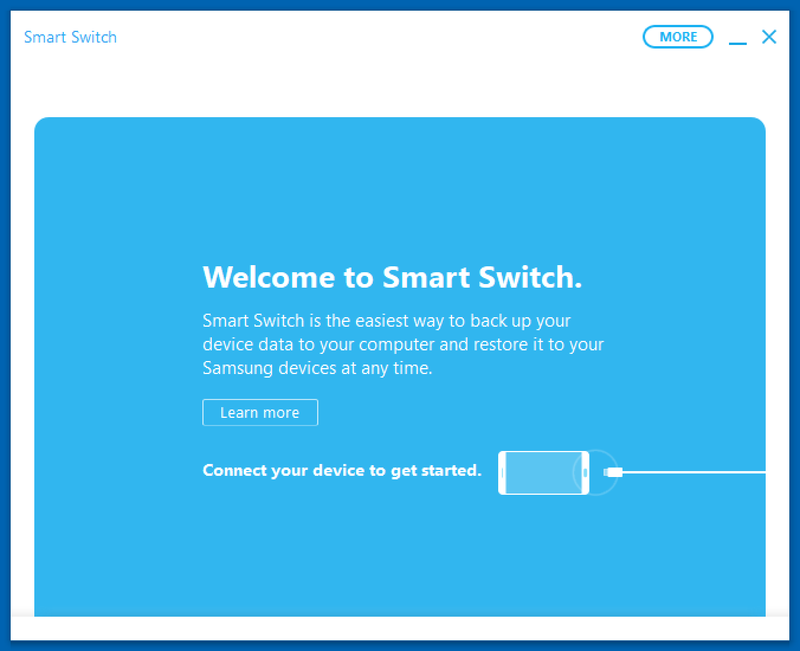 Now go ahead and use the Samsung Smart Switch software’s on-screen instructions to connect your devices and begin the restore process. After connecting your Galaxy device, make sure you choose the latest backup file from the iTunes that you wish to transfer. The menu easily allows you to select saved info such as contacts, calendar, messages, call logs, photos, music, and videos. Moreover, Samsung Smart Switch allows you to download the entire app list, so you can easily download the apps you had previously installed on your iPhone. If you don’t want to go through the trouble of creating an iTunes backup and restore it with the software, you can try the Samsung Smart Switch mobile app. The mobile app allows you to simply import the data stored on your iCloud account without a single cable. With your iCloud username and password credentials, sign into your account. Using the checkboxes, you can select the info you wish to import such as Contacts, Calendar, Call log, App list and more.